Having spent quite a good deal of time over the past few years on many video editing software user to user forums I have come to greatly appreciate the time and assistance freely given to others by those that man these sites. Initially I received invaluable help from total strangers and ended up over time providing help to others when I could. Aside from the the personal satisfaction this provides it has lead me to conclude some important things about these forums and their role in choosing video editing software. First of all whether we like it or not video forums associated with a particular brand have become the de-facto customer support for the software they represent. I think a combination of cost and complexity has lead to most video editing software makers being unable to provide reasonable support for their own products. Do I agree with this? Hell no! BUT, and it’s a big but, the reality is that if you want your problem solved quickly and impartially then a good support forum is a godsend. In choosing video editing software a vital feature of the software not within the software itself but totally external and independent is… it’s forum. Before you decide on which software you want it is a great idea to go and have a sniff around the forum connected to each of the video editing software brands you are considering. Look for questions being asked and answered in a timely manner. This will indicate that the forum is well attended and functioning correctly. Look for the inevitable group of die-hards that are the lifeblood of these online communities. If you see just one or two people constantly answering all the questions then there may be a problem in depth of talent on the board. What you are looking for is a gang of about 6, 7 or more core people who see to it that all queries are answered and the board moderated efficiently. Outside that there should be a wide range of people answering that shows a depth of knowledge and a spirit of contribution to the forum. Look for some long threads. This shows that there is persistence on the part of the contributors to the forum and a genuine desire to resolve people’s problems. Do NOT concern yourself with complaints or cries that the software doesn’t work. The forums were originally intended as a place to share ideas and experiences. The death of in house customer service combined with the marketing b.s. about the “simplicity of video editing” has brought about a change. The change is that the forums are where people go to vent, complain and get problems solved. The truth is that any complaints on a forum are generally going to represent a tiny fraction of the total number of people using the software successfully on their computers. Rarely does someone go to a forum after having installed and used video editing software successfully simply to post that everything went great! Check the general tone of the forum to see that questions are moderated well and that good manners prevail. Take particular note of posts by newbies. (that may be you soon!) Make sure that they are treated with kindness and respect regardless of how inexperienced they are. The last thing you need when you are totally at sea with some new software is some smart**s flaming you or being rude when all you need is a little help. 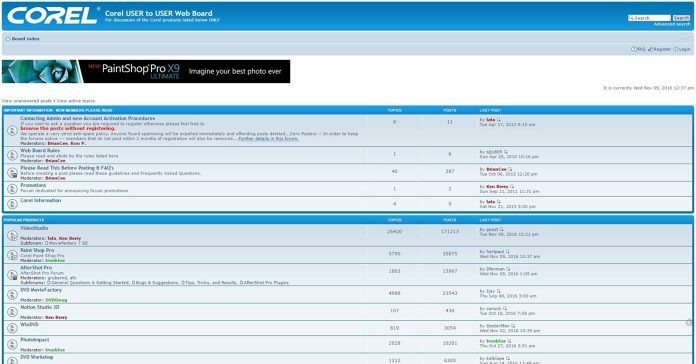 For my money the shining example of everything that can be right about a user to user video forum is the Corel board. Corel doesn’t ever interfere and the board is run by some exceptional people who devote hours of their time to help others. It is everything that a online forum should be. Below is a list of the forums for some of the more common video editing software brands. Take a look around and decide if that is a place you would like to go if you needed help. Video editing software forums should play a major role in your decision as to the best video editing software for you.